Garage: Double, Attached "Oversized & heated"
This executive level custom built Whisper Creek home is the perfect place for the holidays and would be the perfect end to a busy day...or your weekend/summer retreat! Spectacular valley views overlooking the historic Two Dot Ranch and the Porcupine Hills brings peace and relaxation to the mind and body. Privacy & solitude abound, with nature in your backyard. The mature evergreens, willows and poplars are home to an abundance of birds and wildlife....bluebirds, wrens, owls just outside your window or deer grazing on your lawn...... This warm and welcoming home features an open floor plan, 3 bedrooms including a massive master suite with his & hers closets, 5 piece ensuite and a peaceful & private sitting area complete with fireplace. This home was built with many extras and upgrades.....KNOTTY ALDER SOLID WOOD DOORS, CUSTOM FIR MOULDINGS, VAULTED T & G PINE CEILINGS, PINE RAILING & STAIRCASE, PELLA WINDOWS.....to name just a few. Park your 1 Ton pickup in the oversize double attached garage, while your horses have a 40 x 30 foot barn plus lean to call home. 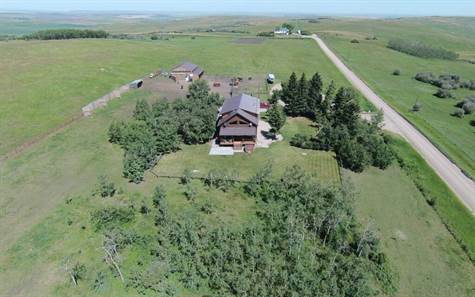 All this is located on 8.67 acres just 15 minutes west of the eclectic town of Nanton. And if you enjoy water sports, Chain Lakes is just 15 minutes west where you can enjoy fishing, swimming or wind surfing & boating. Chain Lakes is approximately 6 miles long, is stocked with Rainbow Trout annually and has a great campground....oh, and a great little ice cream stand as well!! An easy commute from Calgary.......just enough time for you to unwind on the drive home and....only 2 HOURS to world class SKIING!!!! Your new home awaits......call for an information package (too many extras to list) on this beautiful and unique home today!! Come and have a look.......it is worth your time.........and such a beautiful drive! !